1) Interested in the psychology of oneself as a self-development help guide in understanding and utilising the power of your own mind to overcome: anxiety, depression, low confidence, phobias, stress, bad habits (over eating, smoking, drugs, alcohol etc) and more, in order to get the best out of your life. 2) Wanting to have a successful career in Hypnotherapy, Neuro-Linguistic Programming (NLP), Cognitive Behavioural Therapy (CBT), Life Coaching and Psychotherapy as a whole. Developing or enhancing your therapy skills in dealing with all types of clients, to help them recover their cognitive health and well being. Everybody can study this course. It is laid out in layman’s terms, so those with no previous knowledge of the subject, can still learn how to use the power of your own mind to enrich your life. Even if you do not want to be a Professional Therapist, you can still study this course to understand yourself more, for self-help and personal development. This will enable you to break negative habits, and have unlimited confidence with the techniques that you can learn and use in your life, or therapy practice to improve your psyche, or that of a client’s cognitive health (psychological health) and well being. You will also learn how to hypnotise your clients, friends and family, and find the beneficial power of self hypnosis. Once you have studied and understood this full course, for many people it is a life changing experience. My philosophy on therapy and psychology in general is - it is the art of understanding the psychology of people, our behaviour, the mind model, body language, communication and speech. You will be able to understand how your mind works, and how to utilise its power for positive change. I have a very modern approach to therapy for today’s generation, as I am sure you will come to realise as you do the course. Once you have absorbed all the knowledge I will to teach you, you will know more than most therapists that have been in the profession for many years. This course contains valuable information on becoming a Professional Hypnotherapist, CBT, NLP Psychotherapist. I will, in the greatest of detail, educate you in all aspects of NLP, CBT, Hypnotherapy and Psychotherapy, from beginner to an advanced level. Once you have studied this course, you will be able to set up in business as a professional therapist: despite that I still advise all my students to practise on volunteers, for charities, family and friends, before their first paying client. Conducting psychotherapy is an extremely complex and skilful job. Through tailor-made training this will enable you to set up in business, with the greatest confidence in knowledge and skills to succeed in a successful psychotherapy career. WOW! MIND BLOWING, INSPIRATIONAL KNOWLEDGE AND WISDOM, ALL IN THIS COURSE! All members are given a FREE help line after the courses have finished ensuring all therapists have continual ongoing support. 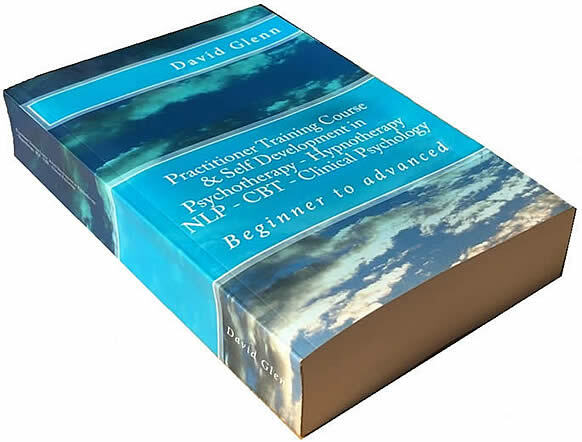 Free day introduction into NLP Hypnotherapy Course. Limited places, see our "course dates" page for more information or contact us. We offer this day so you can experience the quality of our courses from our teaching and we trust that you will want to continue onto a full course. Even though this day is free, we kindly ask those attending to pay a small amount of £20 via online store to cover our cost. History of NLP Hypnosis and Hypnotherapy. The human mind, how it works & the body connection. The analytical or critical layer. Seven Important mind rules. 1)Ideas or thoughts result in physical reactions. 2)The mind delivers what we focus on. 3)Negative thoughts result in organic change over-time. 4)Imagination overpowers knowledge within in the mind 5)Fixed thoughts can only be replaced by another via the subconscious. 6)Opposing ideas cannot be held at the same time. 7)Conscious effort alone, results in opposite subconscious success. Neurosis and psychosis are distinct. Brain wave states, Beta, Alpha, Theta and Delta. Different ways of conducting therapy. Authoritarian,Permissive, Direct and Indirect. The skills required as a Hypnotherapist or NLP Practitioner. The stages to hypnotherapy client success -Trust from your abilities, Building and securing rapport, Focus of attention, Suggestion of sleep, The feedback loop effect from observation. Rapport - The secret of how to influence others- Learn how to use your voice tone and tempo to gain rapport, even on the phone. How to disagree with others and yet keep rapport. Learn how to tell how someone is thinking just by watching their eye movements. Fright, fight or flight responses. Two main types of stress from two sources. Stress Warning Signs and Symptoms. Setting a schedule to overcome stress. The connection between stress and weight gain. Techniques to reduce the build-up of stress, self Hypnosis. Verbal psychology - Learn communication skills - Learn how to listen effectively to others everyday language to see how they limit themselves and how to change. Practice using hypnotic language skills. Voice tone, volume and tempo. Creating affirmations for positive change, words of truth and fact. Words of awareness. Focus of time. Assumed to exist. Commands. Positive thinking affirmations about yourself, I am affirmations. Weight loss affirmations. Psychology of nonverbal communication - body language skills. Preparing for the therapy room. Suggestibility test. Large weight and balloon test, script for large weight and balloon test, Lemon whistle test, Crystal pendulum, line and circle test, Magnetic fingers test, The fragrance test, Clockwise achievement test. The key points and structure of inducing hypnotic trance via Progressive Relaxation Induction. The following is said to the client to induce trance. Hypnotic language patterns for deep trance. Continue to induce trance. Deepening trance via staircase.Continue by deepening trance further via bed image.Continue by deepening trance further via body parts. Continue by deepening trance further if needed. Hypnotic therapy session begins and ends. Sensory Acuity - Identifying the level of trance a client is in. Different states of hypnosis. The waking state (Hypnoidal state), body warmth. The light trance state (Lethargic state), the facial colour change, eyelids movement in R.E.M, white of the eyes, increased lacrimation, reddening of the eyes. The medium state (Cataleptic state), the twitch and obvious movement. The deep state (Somnambulistic), scratching,Quasimodo effect, time distortion. Comatose state. How the treatment of NAC works. Do you need to be an expert counsellor? Conducting yourself in a professional ethical manner. What to charge the client. An explanation of different therapy treatments explained, Analytical Therapy - Hypnosis analysis, Suggestion Therapy, Free Association, Timeline therapy, Compelling future, Creative visualisation & Aversion therapy. Seven steps to analytical therapy success. Seven steps to suggestion therapy success. How to structure all types of successful hypnotherapy/NLP sessions from Stop Smoking, alcoholism, Weight loss, Fears & Phobias, Emotional problems, building confidence, self esteem and ego strengthening and many more. Your client arriving for therapy to leaving. “Yes set” and “reverse yes set” questions. Relevant questions asked in pre talk with the client. Induce trance - Tensed muscular progressive relaxation induction then deepening trance. Boosting confidence within the client. Anchoring good feeling association - Learn how to control your feelings and get into a positive resourceful state anytime, anywhere - Learn how to change yours and other peoples negative emotions to positive with a minute. Improve overall confidence, via a thermometer to 100% successful. Creative visualisation of removing the past. Creative visualisation of future mirror image. End session by waking the client from trance. Phobias session explained - Learn how to permanently remove any unwanted fears and phobias. Confidence session explained - Release past negative emotions such as anger, fear, guilt, hurt and sadness quickly and effortlessly. Weight loss session explained - Learn how to change unwanted habits, beliefs and feelings, including the desire for certain foods. 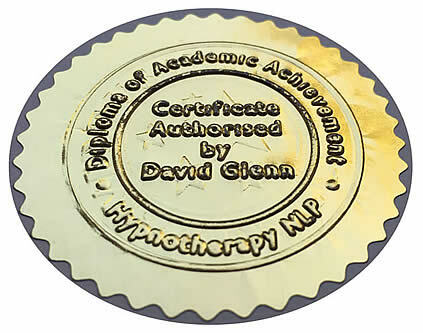 Hypnotherapy NLP at an advanced level. Sexual problems in both the male and female. Stress management and motivation training. Working with clients with life threatening illnesses, disease, chronic illnesses and pain control using hypnotic anaesthesia. Introduction into other areas of hypnosis. Forensic hypnosis regression, U.F.O. investigative hypnosis, Past life regression. Summing up your new knowledge and your final lesson. Misdirection technique or pattern break. Your journey continues as this course ends. Practice Groups and ongoing free support. As you can see the course is vast and no other covers the subject in such detail. 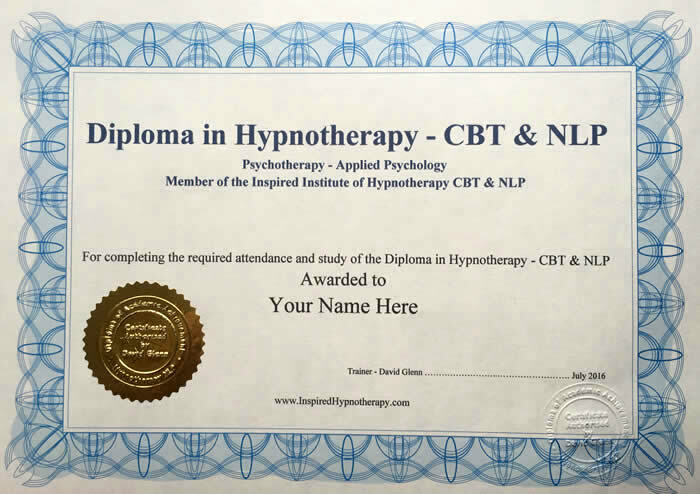 A Diploma of Hypnotherapy is awarded on completion of the course which entitles the bearer to use the letters IDHN after their name, provided you have fulfilled attendance criteria. 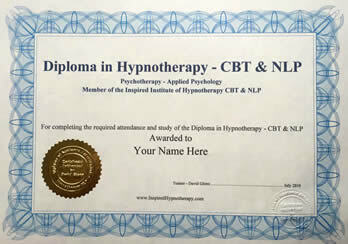 Be the best with hypnotherapy NLP Training Manchester UK. 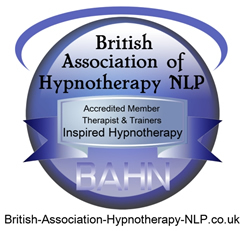 You may also apply to join the "British Association of Hypnotherapy NLP" to then use the letters "BAHN" after your name. Full course manual in both book/ CD Rom format - Certification printed format. Live Demonstrations - Excellent hands on training - Supervised practice sessions - All students are given the course in book format, this saves time on taking notes so more practical skills can be practised. DVD filmed live demonstrations from several famous hypnotherapists as well as the opportunity to see recent educational thought provoking Mind and body films. As part of this course we teach NLP psychology tricks. We do this because they are a great reference to use to show you how powerful the techniques are and how you can use them in the therapy room and general life. Question and answer time, a chance to review what you have learned in the course as shown below. 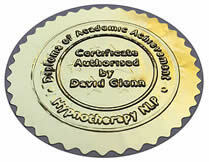 1) You can study this Hypnotherapy Diploma NLP course over a series of weekends. Dates arranged subject to enough people showing interest in weekend study. 2) Study one on one privately with a member of the training team at times to suit you. 3) You may also study the whole course from the comfort of your own home as a home study course. 4) You can also study over five day hands on course. The schedule for the five day Hypnotherapy NLP course is shown in our free trial pack, please ring or email for more details. you to the highest possible level.